This candlestick base has preserved virtually all of its decoration. Many other surviving inlaid brasswares have had their valuable silver picked out. There is one male figure on each of its facets. The nine in the upper row are arranged in groups of three, each showing a seated ruler flanked by two musicians. The figures on horseback are engaged in activities associated with high social rank, including hunting, playing polo, warfare and killing dragons. 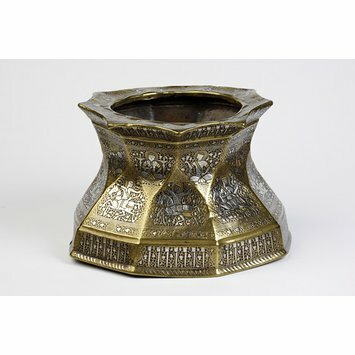 Base of a candlestick made of brass, with silver and gold inlay decoration. Nine seated figures and nine horsemen depicted on each of its facets between two inscription bands. Bought from the collection of Gaston de Saint-Maurice (1831-1905) in 1884. Saint-Maurice displayed his extensive art collection at the 1878 Paris exhibition, in a gallery entitled L'Egypte des Khalifes. This was part of an official sequence of displays celebrating the history of Egypt, presented by the Egyptian state at this international event. Saint-Maurice held a position at the Khedival court, and had lived in Cairo in 1868-1878. Following the exhibition, Saint-Maurice offered his collection for sale to the South Kensington Museum (today the V&A). Brass candlestick base, hammered brass with gold and silver inlay depicting horsemen, musicians and rulers, and calligraphic decoration, Iran, 1300-50. Stanley Lane-Poole, The Art of the Saracens in Egypt, London, 1886, p. 217. 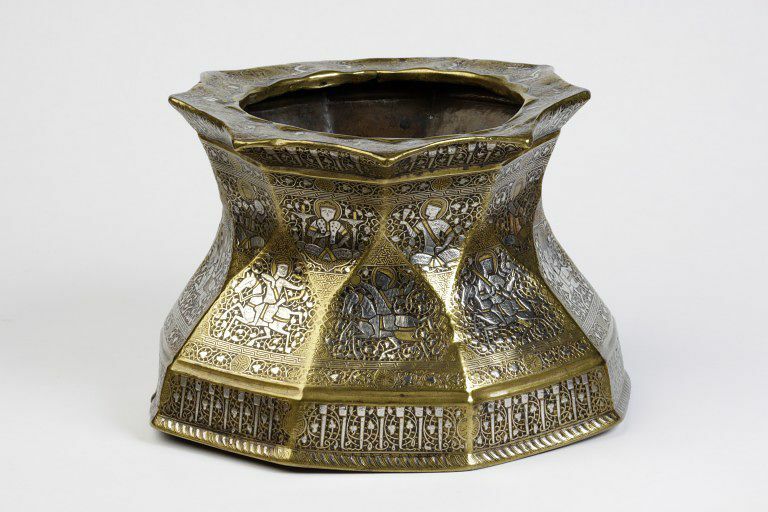 A.S. Melikian-Chirvani, Islamic Metalwork from the Iranian World, 8th-18th Centuries (London: HMSO, 1982), no.88, pp.193-95. There is one male figure on each facet of this candlestick base. The nine in the upper row are arranged in groups of three, each showing a seated ruler flanked by two musicians. The figures on horseback are engaged in activities associated with high social rank, including hunting, playing polo, warfare and killing dragons.